Here is the YouTube link to the SWLRT Municipal Consent Vote during the Minneapolis City Council meeting on September 25, 2015. The three council members who voted against the SWLRT design were Council President Barb Johnson and Council Members Lisa Goodman and Cam Gordon. This entry was posted in Southwest LRT on September 29, 2015 by citoyen1789. The following article by Steve Brandt was published in the September 23, 2015 issue of the Star Tribune. Peter Bell quits as head of advisory panel after saying it has lost sight of its priorities. The chairman of a group advising park officials on renovations at lakes Harriet and Calhoun has abruptly resigned from his leadership position, saying the group is too focused on renaming Lake Calhoun. Peter Bell, the former Metropolitan Council chairman, chided the board for not spending enough time on what he said is its core mission: setting priorities for $3.7 million in spending to renovate park facilities at the lakes. “I think that’s what the public is focused on,” Bell said at a meeting. Bell made the announcement after committee members voted to see where they stand on the name change issue, even though the panel has no authority in the decision. This entry was posted in Lake Calhoun on September 29, 2015 by citoyen1789. I think Peter Bell’s position is correct (“Calhoun name focus prompts resignation,” Sept. 23). Let’s put the Civil War behind us. With due respect to the Dakota name Mde Maka Ska, it is hard to remember, hard to pronounce and hard to spell. Lake Calhoun is a popular lake in Hennepin County. If a poll were taken in the county, it is my belief that the majority of respondents would favor keeping the name they like: Lake Calhoun. Personally, I have yet to meet a single person who favors this change. My other thought: When you have an advisory panel of 21 people, they have to find something to do. the Centrum Room of the Jones Harrison Residence, 3700 Cedar Lake Ave. There will be an Open House at the Bakken Museum, 3537 Zenith Ave. S, Thursday evening, October 1 to review the material from the September CAC meetings. This entry was posted in Lake Calhoun on September 28, 2015 by citoyen1789. Must Diversity Issues Always Drown Out Broader Public Concerns? The following Commentary by Peter Bell was published in the Star Tribune on September 25, 2015. Bell was the appointed chair for the Park Board’s Citizens Advisory Committee charged with making recommendations for a Lake Calhoun/Harriet master plan. He is the former chair of the Metropolitan Council. In this Commentary he speaks of the reasons for his resignation as chair of the CAC. Occasionally an issue surfaces that allows the public to get deeper insight into how our civic institutions work. One such issue is the proposed renaming of Lake Calhoun. I recently resigned as chair for an advisory board charged with making recommendations for a Lake Calhoun/Harriet master plan, focusing on developing a capital budget to use a $3.5 million grant from the Metropolitan Council. The reason for my resignation was that it had become clear to me that the committee wanted to commit far more time, attention and resources to issues that were not a priority with the broad general public. While it was clear from the beginning that the Met Council and the Park Board wanted us to include ideas from diverse communities, I never envisioned this becoming a central organizing principle for our work. This entry was posted in Lake Calhoun, Miscellaneous on September 27, 2015 by citoyen1789. The following invitation is from Park Board Commissioner Anita Tabb. I know that many of you are big supporters of our parks so I wanted to urge you to attend an upcoming meeting about the challenges being faced in Minneapolis and around the country. Next Tuesday evening, we will be holding the Parks Public Forum at the Walker Art Center (invitation attached). Park leaders from Seattle, Portland, New York City and Indianapolis will be speaking about their cities and the funding challenges and solutions that have been put in place in their cities. This evening is an important part of the community conversations about the MPRB funding challenges for our neighborhood parks. The event begins at 6:00 pm, with the panel discussion from 6 to 7:30 pm, and a social from 7:30-8 following the panel discussion. I hope you will attend and be a part of this important discussion. We welcome your perspectives! This entry was posted in Meeting, Miscellaneous on September 27, 2015 by citoyen1789. In its latest attempt to amend the federal hydro power license it was granted in 1999 but has never put to use, Crown Hydro wants to install its powerhouse at the upper end of the lock complex owned by U.S. Army Corps of Engineers, then tunnel underground past the Stone Arch Bridge, at left, to release water downstream. The hydroelectric project that Minneapolitans have wrestled with for two decades is back for a third try at St. Anthony Falls. Crown Hydro is seeking to amend the federal hydro power license it was granted in 1999 but has never put to use. 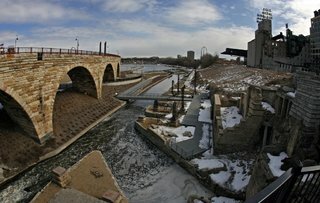 This time it wants to install its powerhouse at the upper end of the lock complex owned by U.S. Army Corps of Engineers, then tunnel underground past the Stone Arch Bridge to release water downstream. Two previous proposals fizzled. This entry was posted in Crown Hydro on September 27, 2015 by citoyen1789. The following linked articles are from the Hill and Lake Press and relate to SWLRT. The September Hill & Lake Press has been posted on the website. Of particular interest are three timely SWLRT articles. They can be accessed by clicking on the above link to the Hill and Lake Press website. One article is Susu Jeffrey’s ” SOUTHWEST LRT: Developing Minneapolis from City of Lakes to City of Stadiums.” This is on page 3. The second article is Michael Wilson’s “Council committee recommends approval of revised SWLRT plan.” This is on page 1.
in municipal consent consideration.” This is on page 5. Note especially the 14 photos on p. 4 of many of the people who continue to fight the good fight and spoke at the September 15, 2015 Transportation & Public Works Committee meeting. This entry was posted in Southwest LRT on September 25, 2015 by citoyen1789. Attached is a 5-page letter from the St. Anthony Falls Alliance to FERC, dated August 28, 2015, regarding the Crown Hydro project. This entry was posted in Crown Hydro on September 24, 2015 by citoyen1789.